When our school aged students have extra time, we love to give them an opportunity to progress quickly, by offering intensive training seminars. On holiday weeks, and over the summer, we offer training seminars that give students the chance to get months of training time in a single week. During these seminars we blend the standard student curriculum with some unusual training experiences. The result is a fun experience that helps students explore more of the martial arts while making rapid progress in their rank progression. It is not uncommon for students to come out of a seminar receiving two or more stripes in a single week and reminding them that if you put in exceptional effort you get exceptional results. 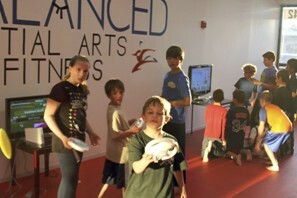 Each seminar is unique and tends to have their own restrictions based upon age and experience. However, most seminars require a student to have a yellow belt or higher and be between the ages of seven and twelve years old. Pizza Nights are held the first Saturday of every month, with the exception of holiday weekends. They are great for parents and students alike. As an optional event, you will need to sign up in advance. For safety reasons, we limit the number of students who may participate. Pizza Night is approximately four hours long and serves as a social bonding experience for our students and a tremendous resource for their parents. For the children, building a strong sense of community is helpful to build up a student’s ability to face adversity in training. These friendships are often critical in carrying a student through the hardest parts of the training experience. For parents, having a consistent vehicle to rely on where your kids will have a great time while under the watchful eyes of responsible adults is an invaluable resource. It also gives you the time to catch a movie, go to dinner or just have some peace and quiet. 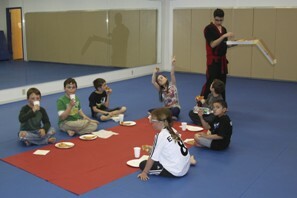 Pizza Night is generally only open to our students between the ages of seven and thirteen. Exceptions are sometimes made for siblings of students or children of our adult students. However, you do need to approve this exception with the instructors before signing them up.